Paul Lane and Albie Loeffler retired decades ago. 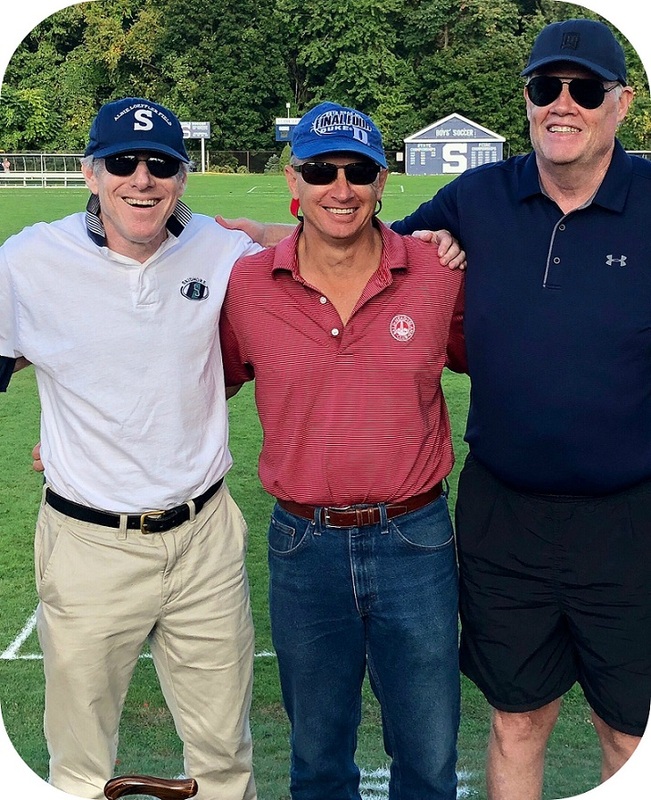 But both men — longtime Staples High School coaches, physical education instructors and friends — are back in the news again. 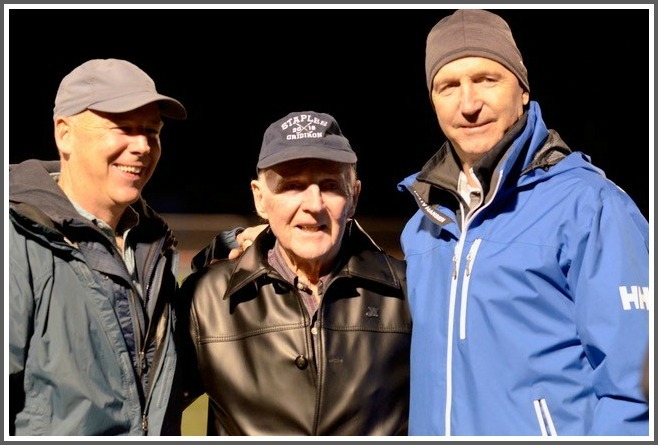 Lane — one of Staples’ legendary football coaches — was honored at last week’s game against Norwalk. Between 1962 and 1987, Lane led the Wreckers to 4 FCIAC Eastern Division championships, 2 FCIAC crowns, and 122 victories. His 11-0 1975 squad was the last single state champion — determined by sportswriters — before the current playoff system began. In the 1967 FCIAC title game, Staples snapped Stamford Catholic’s 30-game win streak, 8-0. The Crusaders — ranked #1 in Connecticut – had outscored their opponents 333-66. The Wreckers stopped them twice on the goal line, in the last quarter. Paul Lane (center) at last week’s Staples High School football game. He’s flanked by his sons Peter (left) and Skip. Both played for him. Lane started coaching football in the Army in 1950. He then served as an assistant to Frank Dornfeld for 8 years, before taking over the top job. At Staples, Lane also won state championships coaching indoor and outdoor track — and girls golf. He grew up in Bethel, but his family has long ties to Westport. He’s been a Compo Beach resident nearly all his adult life. Former players — and of course his sons Skip and Peter, both of whom played for him — often drop by to chat with their former coach. Last week on the football field, Lane was introduced with a video produced by Justin Nadal and Staples’ media lab. Then he shook hands with coaches and players, stood beside the team for the national anthem, and headed to the 50-yard line for the coin toss. 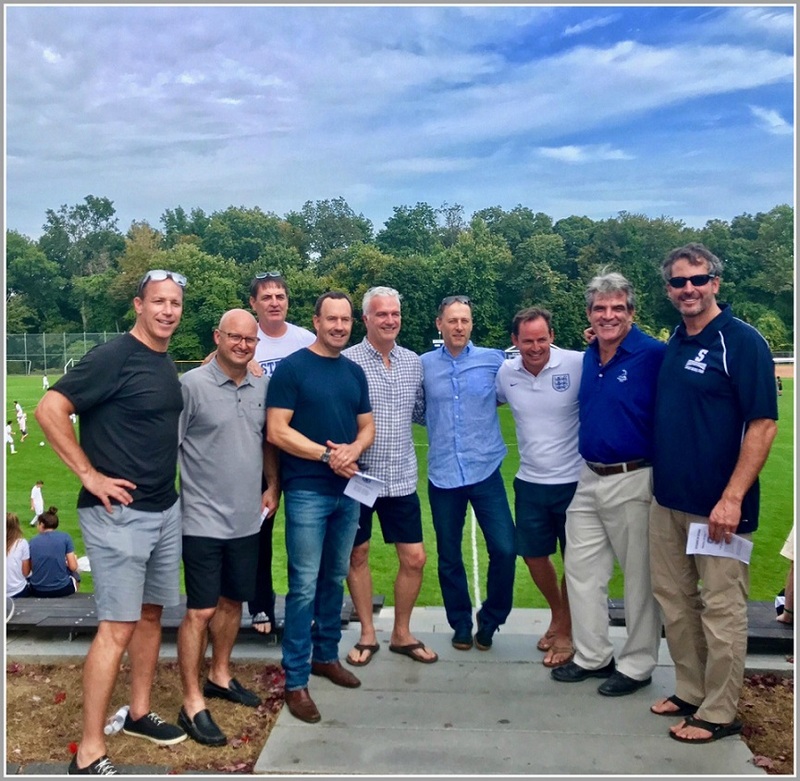 This week also saw the announcement that Loeffler — who, with Lane, co-owned a summer sports camp for Westport youngsters in the 1950s and ’60s — has been selected for the United Soccer Coaches Hall of Fame. He’ll be inducted at the organization’s annual convention in Chicago this January. Loeffler joins 62 other major contributors to the game. The Hall of Fame already includes legends like former men’s national team and University of Virginia coach Bruce Arena, women’s national team and University of North Carolina coach Anson Dorrance, and University of Connecticut coach Joe Morrone (with whom Loeffler co-founded the Connecticut Junior Soccer Association). Loeffler — who died the day before his 94th birthday in 2009 — was a goalkeeper at the University of Connecticut. He began his coaching career in South Windsor (1942-52), where he won 2 state championships. He came to Staples in 1952, teaching phys. ed. and coaching basketball, baseball and track. In 1957 he formed a club soccer team. The next year it earned varsity status. His Staples record includes 12 FCIAC titles and 7 state championships — 5 of them in a row. His teams recorded 25 consecutive shutouts (including post-season tournament games), won or tied 43 straight matches, and lost just 2 home games between 1966 and 1974. When he retired in 1978, his 314 career wins was a national record. Loeffler was a 2-time National Coach of the Year. More than 175 athletes went on to play college soccer; 11 became All-Americans. Albie Loeffler (left), coaching a Staples High School soccer team in the early 1960s. In 1998, the soccer field at Staples was named in his honor. Earlier this month, it was the site of the program’s 60th anniversary celebration. Loeffler’s daughter and grandson will accept his posthumous award in Chicago. I’ll be there too. Albie Loeffler was my mentor. I played for him. He got me involved in coaching — and in the United Soccer Coaches organization. He was an original member when it was formed (as the National Soccer Coaches Association of America) in 1941. I am honored to have known Albie Loeffler. I’m glad I’ve continued my long friendship with Paul Lane. And I’m proud that both men are back in the headlines, in the town where they influenced countless lives. In the nearly 60 years since Staples High School fielded its first boys soccer team, some legendary athletes have laced up their boots. Plenty more played without achieving fame. But they loved the program, made great friendships and created lifelong memories. Inevitably, a few of those players died young. Yesterday, alumni came from as far as California. 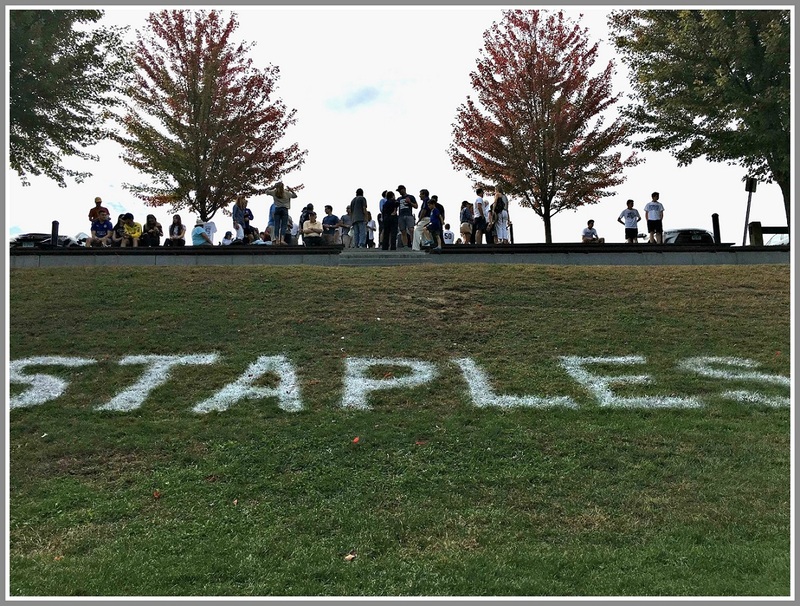 They gathered together to see a game between 2 top teams — and to help dedicate Staples soccer’s “Etched in Stone” project. It’s a permanent memorial to members of the program who died before their time. 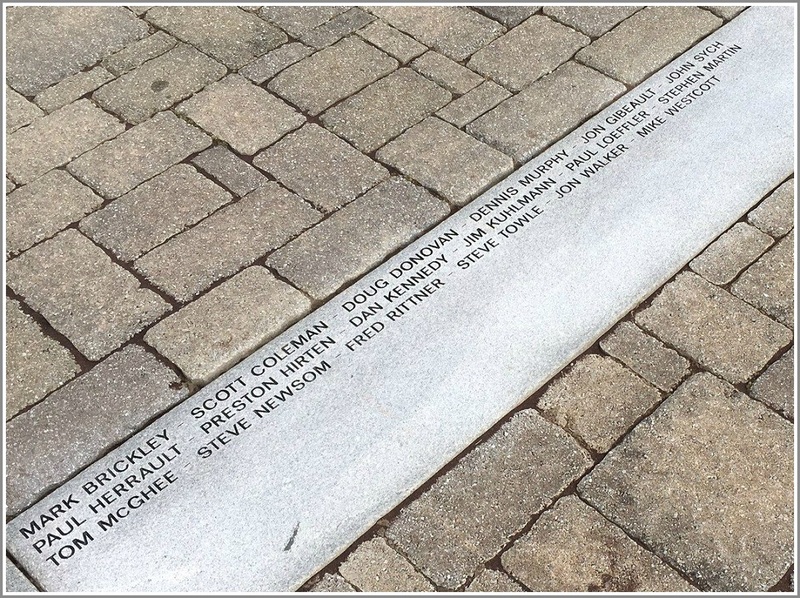 Their names are now inscribed in the terrace, at the top of The Hill. 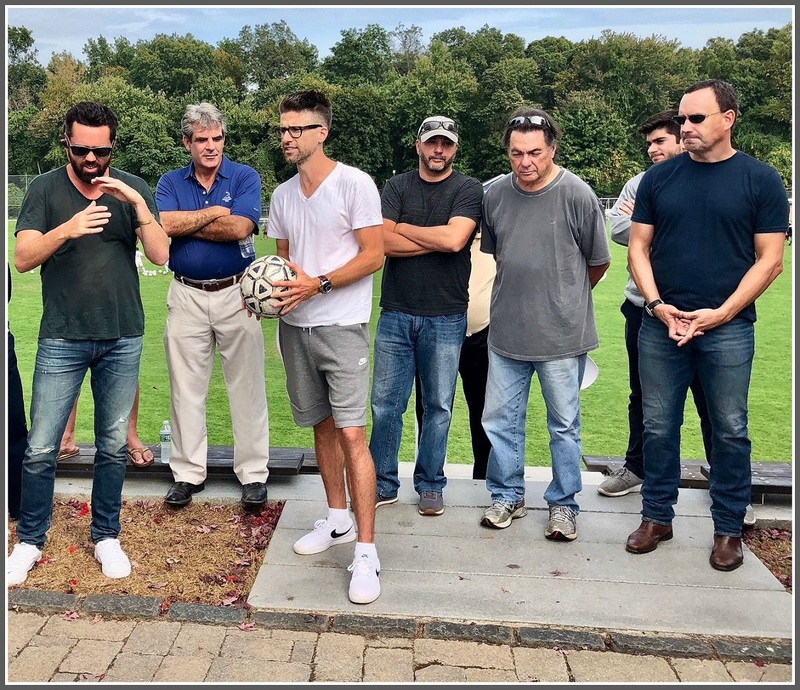 Kyle Martino — a 1999 graduate who played on the US men’s national team, and is now a noted NBC Sports Premier League analyst — helped organize the project. 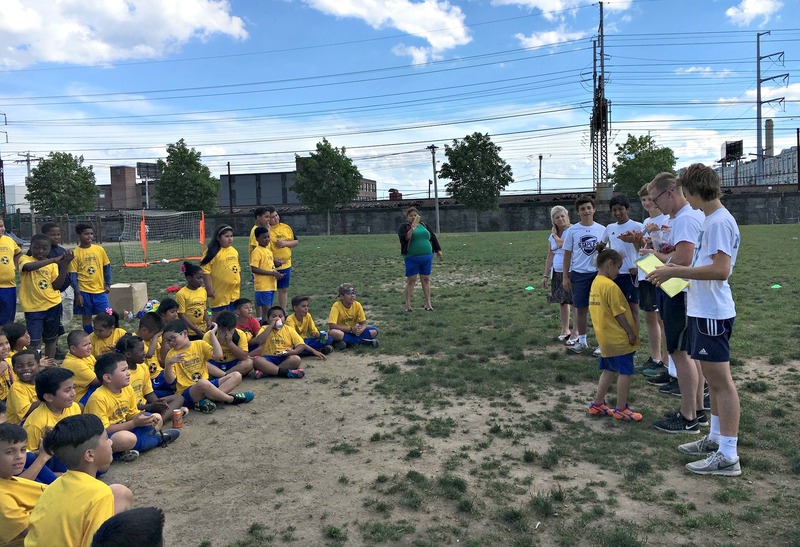 His speech yesterday emphasized the importance of the Staples soccer community; the “family” bonds that have been formed across generations, and the feeling of legacy that joins current players with past (and future) Wreckers. US soccer star and NBC Sports analyst Kyle Martino (with ball) addresses the crowd. At far left is Brad Tursi. His brother Drew’s death last winter sparked Martino and his teammates to create the “Etched in Stone” project. Drew spent many hours on The Hill, watching Brad and his friends play for Staples. After the brief ceremony, the large crowd enjoyed a crackling match. Stamford eked out a 1-0 win, in a nail-biting finish. Then the alums took to Loeffler Field, for a classic pick-up match. Jon Walker died last week, of complications from ALS (Lou Gehrig’s disease) and frontotemporal degeneration, a rare brain disease. He was 46 years old. Jon was part of the very tight-knit Staples High School Class of 1988 — a group that’s remained loyal and true ever since graduation. 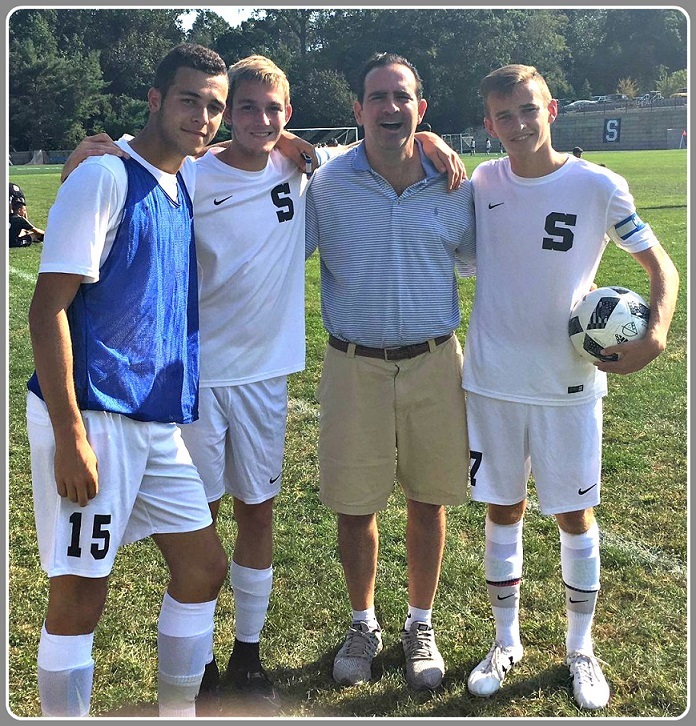 Jon was a 3-sport athlete, with a sly wit and tremendous “people skills.” I was fortunate to coach him in youth soccer, and was overwhelmed to see how many friends, teammates and admirers attended his memorial service on Sunday. Westport in the 1970s was classic suburbia. On any given weekend the fields and courts at Coleytown, Long Lots, Rogers, Kowalsky, Gault and Bedford buzzed with activity. We competed in Little League baseball, rec and travel soccer, and YMCA basketball. In a town filled with many outstanding adolescent athletes, it was Jonathan Walker who truly stood out. His uncanny athleticism bordered on artistry. To watch Jon swing a baseball bat was an experience. It was effortless, and so smooth. He had unrivaled hand-eye coordination. Jon was also a master strategist. He understood and executed gamesmanship before it was even part of athletic nomenclature. If his brother Sam was (and still is) the Luke Skywalker of “gamesmanship,” Jon was Obi Wan. He knew how to exploit others’ weaknesses, and maximize his strengths. Jon was as clutch as they came. His heroics under pressure cooker atmospheres are still talked about with great admiration and awe. Slotting the deciding penalty kick side panel in the U-16 state cup soccer quarterfinal against Wallingford; draining a fadeaway buzzer-beater for Staples basketball his senior year, or scoring the winning goal in sudden death overtime in the 1987 FCIAC soccer championship before 2,000 fans under the lights at Wilton High School — Jon was clutch. With the game on the line, he was your man. 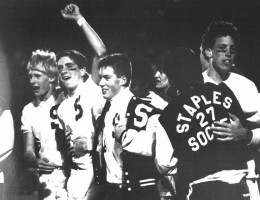 Jon Walker (raised hand) celebrates with Staples High School teammates, after scoring an overtime goal to win the 1987 FCIAC championship. He played 3 years of varsity basketball and 2 years of varsity soccer at Staples. Late winter of his senior year, sitting at lunch, Jon and Rob Capria got into heated banter about baseball. Rob was adamant that Jon did not have the ability to make the team — especially after 4 years away from the sport. On a dare — having not picked up a bat or glove for that long — Jon went out for the team. Five games into the season, he was the starting 3rd baseman. He was a natural. After high school Jon ventured to George Washington University for a year, before transferring. At Skidmore he played varsity basketball for 1 year, and varsity soccer his junior and senior years. Coupled with his athleticism was Jon’s love of competition. This past October, we played 9 holes of golf at Longshore. His ALS limited his mobility to the point where it took him 45 seconds to tee up the ball at each hole. He had no ability to speak. His longtime friend Andrew Udell — whose support and commitment to Jon over the past year has known no bounds — shot a 46. I shot a 57. Last fall, Jon Walker was a popular presence at Staples High School soccer games. He had lost the ability to speak, but he was embraced by the team, and responded with thumb’s-up signs of encouragement. Here he is flanked by captains Josh Berman, Spencer Daniels and Daniel Reid. Usually at this point Jon would say, “Lets go to your house and get a BSIT” — an acronym he made up for the “Best Sandwiches in Town.” Off we would go to 102 Bayberry, where we plowed through Gold’s cold cuts, and he would play with my parents’ dog Willy. With a tight circle of friends — many of whom rarely shied away from the spotlight — Jon kept a lower profile. But he was always present. A quiet leader, he knew how to motivate and push buttons. Jon was a dichotomy. In many ways he was very simple. He didn’t embrace the urban setting of DC his first year in college. But he flourished in the intimate community setting of Saratoga and Skidmore. He never had the desire to move to New York or any other city. He loved Fairfield County. He didn’t like change. He worked for the same company for over 20 years. (He did leave for a brief stint as a trader. His New York commute lasted 3 weeks.) Jon could have thrived in that scene, but it wasn’t for him. 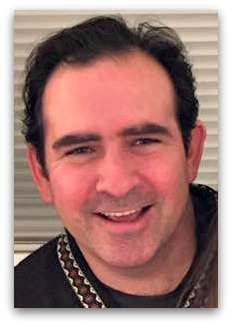 He loved the simplicity of the suburbs, and playing basketball, soccer, and softball through his 40s. As much of a “country boy” as he was, Jon’s street smarts were off the charts. When we were 16 Jon, George Llorens, Ryan Burke and I took a trip to New York to see a Knicks game. As we exited the Garden, a hustler looking to capitalize on 4 sheltered suburbanites said, “I get you a cab.” Unbeknownst to us, this wasn’t a free service. That was JW. He was street savvy, skeptical, and took great pride in not being manipulated or taken advantage of. The 1986 Connecticut state soccer champion Westport Warriors team. Jon Walker is in the back row, 2nd from left. Jon’s competitive drive and relentlessness served him well when he met Bridget. He pursued her with abandon, and knew he had found his soulmate. Wildly loyal to each other, they navigated the challenges that can come with marriage with sensitivity, fearlessness and passion. They were true college sweethearts. Jon loved being a dad. If there was anyone he loved as much as Bridget, it was Ellery. She lit up his face. And his adoration for William knew no bounds. He loved sending video clips of William playing indoor soccer. He was a proud soccer dad. Jon battled his ALS and FTP with courage and a smile. 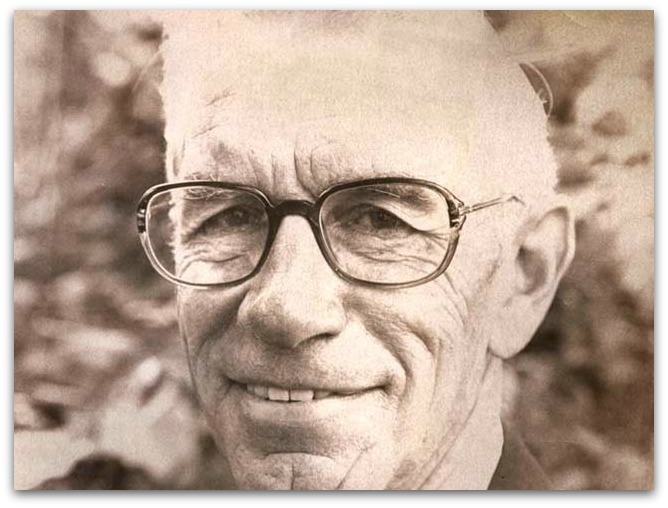 As his neurological diseases progressed, he became much simpler. He smiled more. He said “I love you” often. The grace he displayed as an athlete came to the forefront of his persona at the end. 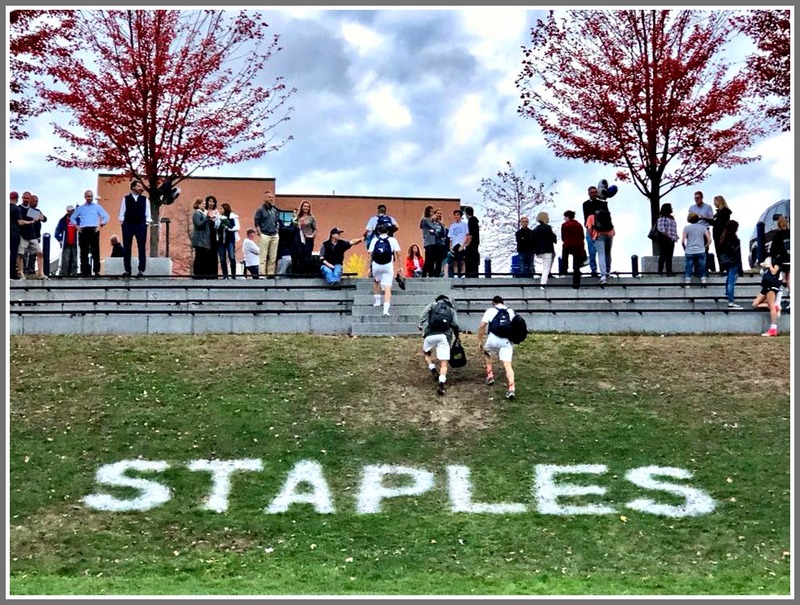 Staples High School athletic uniforms get plenty of use. Typically, a varsity team wears a set for 3 years. They’re handed down for 3 more to the junior varsity, then maybe the freshmen. Finally, they may be tossed out. Sometimes, a coach or parent finds a good use for them. Or else a Staples custodian does. Elsie Calderon has worked at the high school for many years. A native of Costa Rica, she’s a big soccer fan. Her son Jose played the sport at Norwalk’s Brien McMahon High. Every year, Elsie collects used sports equipment, from various sources. She cleans it, packs it up, and sends it to family and friends back home. The Staples High School boys soccer team was happy to contribute old home and away jerseys. 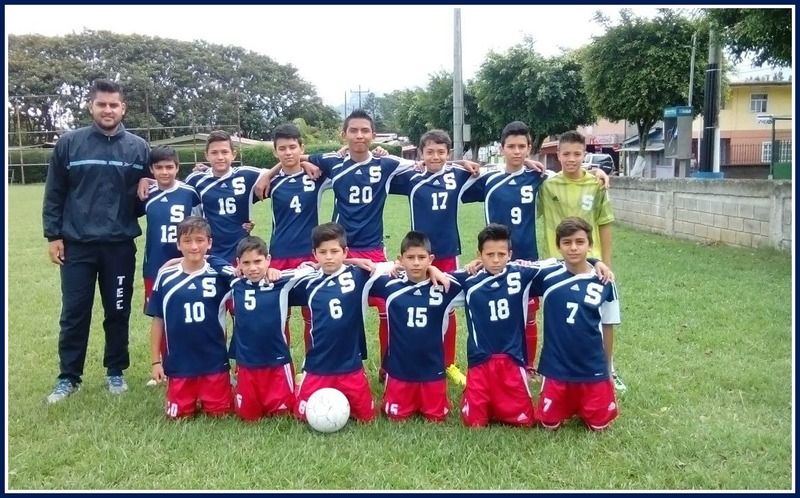 They’re now worn proudly by youth teams in Central America. So the letter on the front fits perfectly. Every March, the A Better Chance “Dream Event” is one of the greatest feel-good galas of the year. Each time, the graduating seniors’ speeches are the highlights of the entire evening. But Luis Cruz’s speech Saturday night to an overflow crowd ranks among the best ever. This program has meant a lot to me and my family. It is because of people like you that I was given this opportunity — to live in one of the best communities in the entire country. 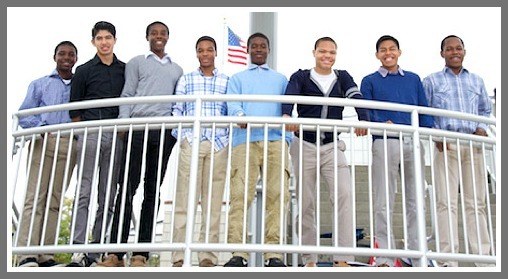 The 2014-15 A Better Chance scholars. Luis Cruz is 2nd from right. Leaving Newark to see the A Better Chance program for the 1st time, I was filled with mixed emotions. I wasn’t sure if I was ready to leave the life I knew — the ice cream trucks marking the rhythm of the day as they repeatedly passed my apartment; seeing and hearing kids playing in the open fire hydrants, and watching the sea of kids riding their bicycles toward the park, which I used to do every Friday with my friends, until my mom took away my bike because she didn’t want me to get hit by a car. Pulling into Westport I saw big homes, with big yards, with big cars, parked in front of their big homes. There was grass everywhere — green and perfectly trimmed. Instead of crowds of people, there was a parade of SUVs. Joggers and deer shared the roads. I remembered my middle school, with its security guards in every hallway. In Newark there were fist fights, food fights and paper fights. My classmates cared only about their reputation and looking fresh. No one really cared about school. In Westport, it’s pretty funny to me that the richest kids come to school looking so ruffled. Kids in Newark wouldn’t be caught dead looking that poor. When the principal visited a class in Newark, that meant another lecture. In Westport, it means that Mr. Dodig wants to know how I’m fitting in and what I did last weekend. The A Better Chance program has allowed me to take advantage of many opportunities in Westport. I have grown a lot from all of these experiences, especially from joining the great athletic programs at Staples. Luis explained how — although he was “a bad soccer player and a terrible runner,” and had a very difficult time with the fitness demands — freshman coach Chris O’Dell took him aside. I hesitated, as I was in such pain and agony. “Yes, Coach O’Dell. I’ll take that challenge.” From that day on, I never looked back. 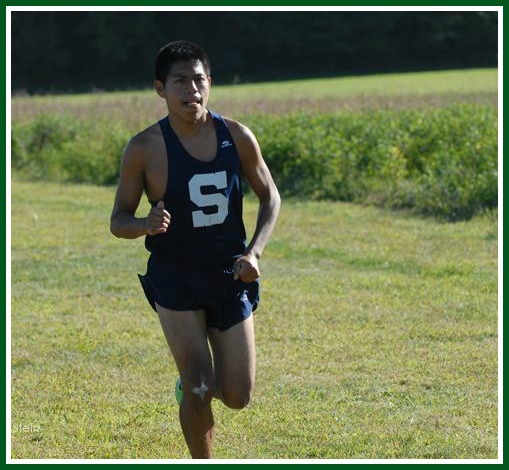 Luis Cruz: cross country star. 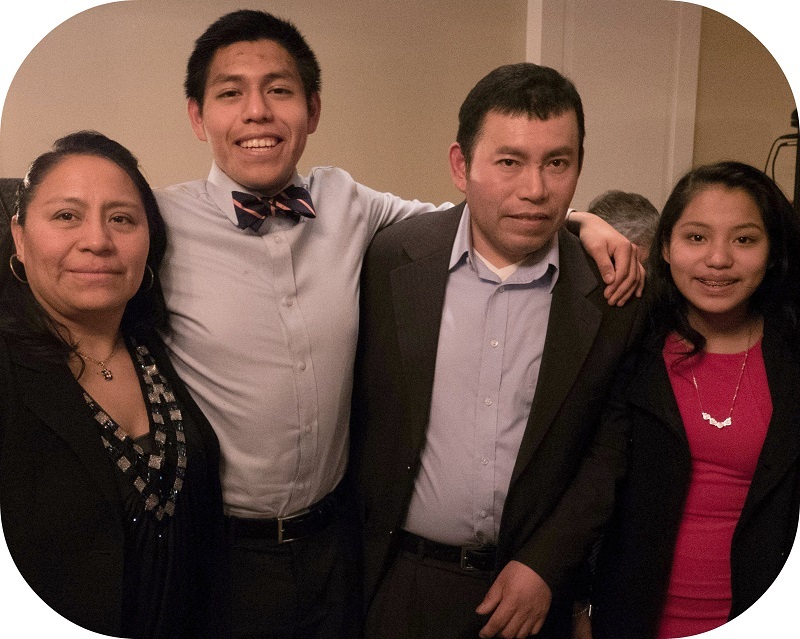 At the New England Outdoor Championship, in spring of sophomore year, Luis earned All-New England status. I was so proud of myself. I wanted to tell everyone what I had just accomplished. The only sad part was that my parents weren’t there to see it. All I could do was send them a video and show them my medal. But what really counted is that they knew I had worked hard for this. 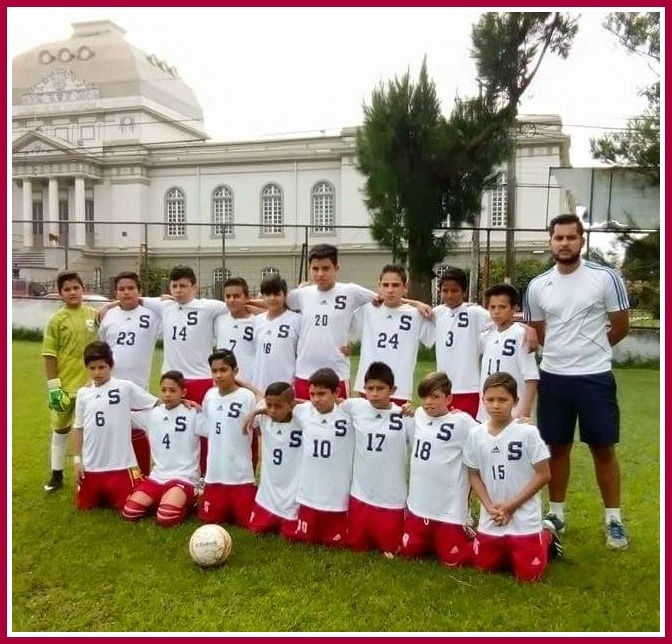 Luis traveled to Costa Rica, for a summer program. It opened his eyes to even more possibilities. I realized that humans have the power to make a difference. This is why I am considering becoming an engineer. Solving real-world problems, using my talents in mathematics, is how I want to effect positive change in the world. On the surface, it was an easy decision to join A Better Chance, to go to a school with all the resources a student could possibly need. My mother and father were proud of me for making the decision to explore a different way of life, yet they were silent on the car ride to Connecticut. We all knew that the next 4 years were ones we wouldn’t get back in terms of being a family. My parents never got to see me pick my first pumpkin. They missed the chance to see me break the 5-minute-mile barrier. They never got to see me play soccer on a team with uniforms and real cleats. They weren’t there to comfort me when I lost a race for my team because I dropped the baton. But they will be there when I graduate high school. And I know they will be there when I graduate college! It has been difficult at times, living between 2 very different communities and cultures. But the sacrifice has paid off in my achievements, both academically and socially. I will have more choices than my parents had. I marvel now that my parents have survived in a country where they barely speak the languages. I am also amazed and thankful that they realized that education is the key to a better life. My parents and I talk nearly every day. They are nothing like typical teen conversations. I have so much to say to them, because all of my experiences are new to all of us. I remember buying my 1st pair of Sperry Topsiders. While that is not an event worth discussing for some, for me it was a milestone. My parents and I talked about it forever — once I told them that they were shoes. Now, in less than 3 months I will become the 1st person in my immediate family to go to college. Just like Forrest Gump, I went from being average to being a winner. I am Luis Cruz, aka Papi, your friend. Thank you! The snow is light and fluffy. There’s less of it than everyone expected. But it’s still a lot to contend with — particularly if you’re elderly or disabled. Members of the Staples High School boys soccer team have volunteered to help. With school canceled, they’re available to shovel out folks who can’t do it themselves (or have no able-bodied kids of their own). Because many of them can’t drive — or their parents don’t want them to — the offer is limited to neighborhoods where players live. So there are no promises that a match can be made. But if you’d like a soccer player to help, email dwoog@optonline.net. I’ll do the best I can to send a strong teenager. NOTE: Any other Westport youngsters (or older!) willing to volunteer are welcome to join in this community effort too. Just email dwoog@optonline.net, and tell me where you live. I’ll add you to the list of volunteer shovelers! 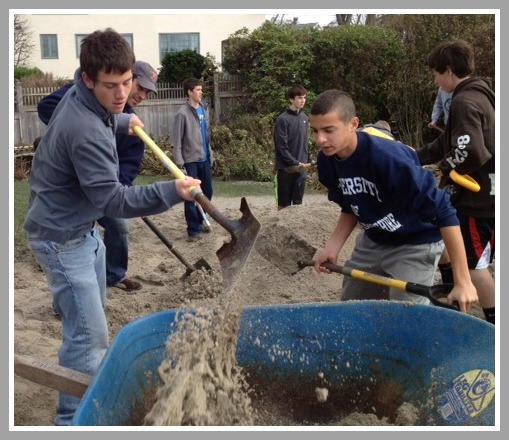 After Hurricane Sandy, Staples soccer players helped clean up sand from front yards on Soundview Drive. 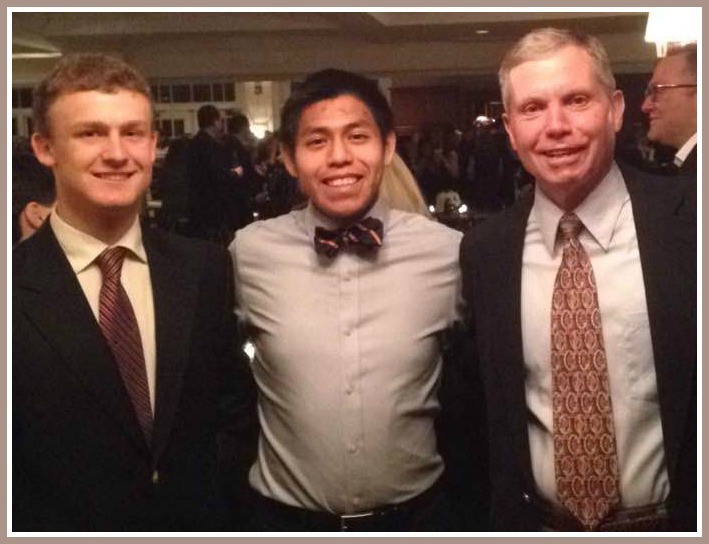 For a few years, Martin Jacobson and I have tried to get our soccer teams together. I coach the Staples High School boys varsity. He coaches Martin Luther King in New York City. We’re a pretty decent Connecticut team. MLK is the 2-time defending NYC public schools champion. And they’ve won that title 14 of the last 17 years. This year, our schedules meshed for a pre-season scrimmage. On Sunday, the King guys and their coaches came to Westport by train. Our parents met them at the station, and drove them to Staples. A large crowd enjoyed a very competitive match. The visitors pulled away for the win, but the play was tough, good and fun. 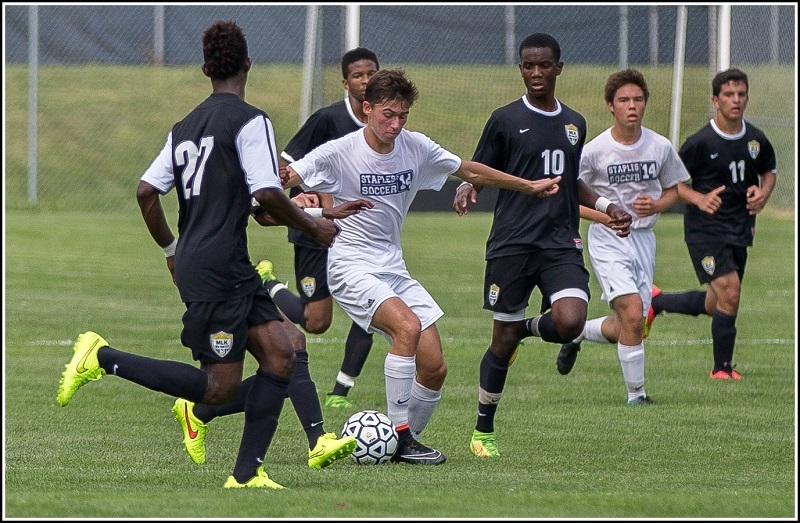 Staples soccer players, including Nate Argosh (left) and Kenji Goto, played against New York City powerhouse Martin Luther King HS. (Photo/Kim Lake). Afterward, the MLK players and staff piled back into parents’ cars. At Compo Beach, Staples’ Barbecue Club — yes, there is such an organization, and they’re great — prepared a feast. The food was fantastic. The soccer match was tremendous. But the highlight for both teams might have been the impromptu volleyball tournament that sprang up. Players from both squads — the city school, and the suburban one — divided themselves evenly, into 4 teams. They took over both volleyball courts. And for a solid hour — until a sudden rainstorm — they played, laughed and high-fived together. 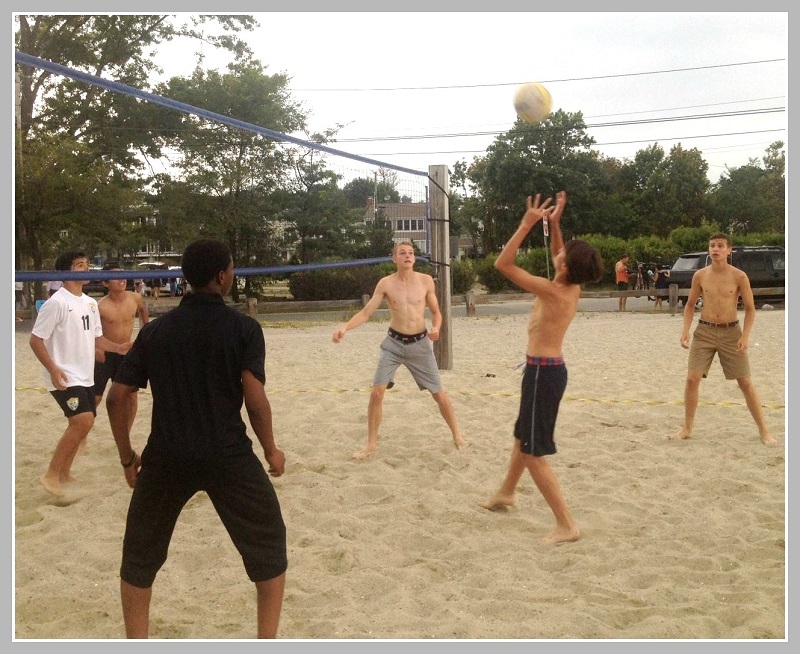 Players from both teams mixed and matched for an impromptu volleyball tournament. Back at the train station, the MLK coach and I pledged to make this an annual tradition. I don’t want to make more of this than it is. It was just an afternoon mixing strong competition with holiday weekend relaxation. Sports are a wonderful way to bring people together. Kids are kids, wherever they live. Westport, Connecticut may not be representative of America. But neither is Ferguson, Missouri. The World Cup soccer tournament is about to begin. It’s a month of worldwide excitement, luring in even casual fans. And the Staples boys soccer program invites all of Westport to take part. On Sunday, June 22 the Wreckers are sponsoring a unique “Westport World Cup Day.” The event combines every element of the World Cup: competition, camaraderie and passion. On that day, the US plays Portugal in a very tough match. From 3:30 -5:00 p.m at the Staples athletic fields, elementary and middle school-age players are invited to “warm up” with an afternoon of small-sided games and fun. Staples players will organize the events, including mini-tournaments, a dribbling obstacle course, a penalty kick contest and more. At 5 p.m.,food trucks at Staples will serve a “pre-game” meal. At 5:30, everyone heads to the Staples auditorium. The US-Portugal match — a key one for the Americans — will be shown on a 20-foot screen. We can’t be in Brazil, but we’ll cheer the Americans on as loudly as we can. At halftime, there’s a raffle with an amazing prize: a special, behind-the-scenes tour of ESPN headquarters conducted by Jeremy Schaap (a Staples grad, and member of the broadcast crew). Up to 8 people will enjoy a day in the studios and digital center, with lunch in the ESPN cafeteria. Staples boys soccer head coach Dan Woog — that’s me — says, “We hope you can join us for all 3 events: kids’ event, food, and the World Cup match. But if you can only make 1 or 2, that’s fine too. 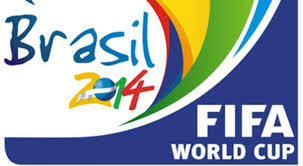 We want everyone to get a taste of the World Cup.” Click here to save a spot. But wait! There’s more! Special t-shirts will commemorate the day (and help defray costs). Click here to order (June 10 deadline). 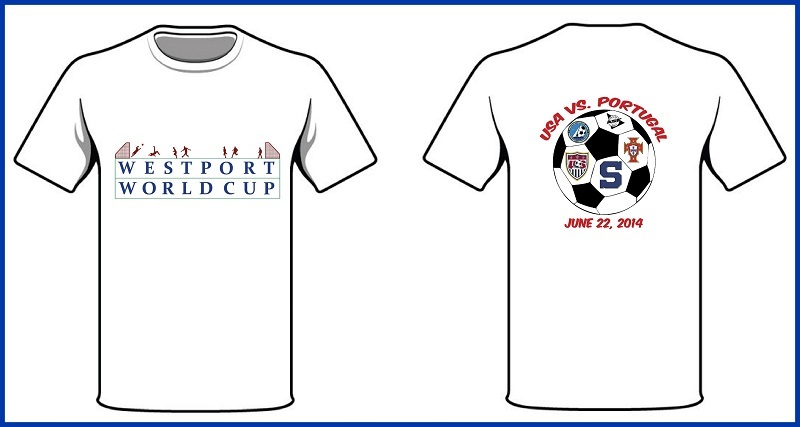 The World Cup is special — and so is Westport soccer. The Staples boys soccer program looks forward to sharing the excitement with fans throughout town on June 22. The front and back of the commemorative t-shirts. Deadline to order is June 10.